Are you listening to your employees? It’s important to gather feedback from your employees on how you can be a better leader. A strong feedback system not only benefits your team, but also your company’s bottom line. Managers who received feedback on their strengths showed 8.9% greater profitability. Understand how your team views you as a manager by collecting their honest feedback in real-time – learning both your strengths and weaknesses can improve your management skills. Gathering feedback is one thing, but doing something about it is another. According to 1,400 executives polled by The Ken Blanchard Companies, failing to provide feedback is the most common mistake that leaders make. Make sure you take the time to listen to your employees’ feedback, provide your response, and take action. Show them you’re listening by taking the steps necessary to address any level of disengagement right away. Inexperienced managers often fall into the trap of thinking that the way to develop a positive work culture is to make sure that all their employees like them. Now, you may think this sounds perfectly reasonable — and indeed, you won’t be a successful leader if your team members can’t relate to you at all — but a preoccupation with being “nice” can cause you to let boundaries of authority erode. You’re the one who has to hold your team members accountable. Corporate consultant Carlann Ferguson points out the useful concept of “caring”: “Remember that caring is different from wanting to be liked. Caring is non-conditional and applies to every employee.” There are HR best practices for building employee success, but those practices are based on respect rather than in misguided efforts to be pals with your direct reports. Jennifer Chatman, a faculty member at UC Berkeley’s Haas School of Business, has some additional pointers to help new managers to stay focused: Instead of being preoccupied by how much is at stake if a specific task isn’t completed correctly, try concentrating on the benefits of delegation. Your employee accountability will increase, your team will gain confidence with each project they complete, and you’ll have more time to focus on the work that only you can do. Just 35 percent of employees state that they have clear performance goals. This lack of clarity sometimes results from a new manager getting bogged down in daily processes and losing sight of the crucial outcome of everyone’s efforts. If you were guiding an expedition through the wilderness, you’d need to know how to recognize your destination, which route to follow and how long the journey would take. Without that crucial knowledge, you wouldn’t be able to gauge how many supplies you’d need to bring along or how much ground your group would need to cover every day. There’s more to leadership than simply making sure you’re guiding everyone along the right path, however. It also includes communicating a clear purpose. When you include the company mission and values as part of your expressed goals, your overall employee alignment will stay vibrant and strong. It’s exhilarating to receive a promotion and be given new responsibility for supervising others. You have every right to feel proud of your accomplishment, but it’s important not to rest on your laurels. Now that you’ve achieved a significant growth in the organization, consider your position to be a stimulus for acquiring a new set of skills. Regardless of whether you happen to have personal talent for managing others, leadership is still something that can be taught, and U.S. companies dedicate nearly $15 billion annually to leadership development programs. You may have to take the lead in reaching out for training and development, because despite the substantial investment mentioned above, leadership development is rated at “below average or poor” in over one-third of organizations. Another one-third have only average leadership development options, and only 31 percent of organizations state that they give their managers “above average” or “exceptional” training. Skillful leadership is a key factor in maintaining employee engagement, and gaining additional skills will yield a positive ROI for your organization. The importance of establishing an employee recognition and rewards program cannot be overstated. You may have a few standout team members whose work is obviously praiseworthy, but it’s not enough to recognize only the very top performers. Achievers’ infographic highlights this point, stating 44% of employees cited lack of recognition and engagement at their current employer. When you understand the roots of employee motivation, the necessity of offering frequent employee recognition becomes clearer. While monetary and social recognition is always engaging and welcome, true employee happiness is based on many other human factors as well. Mindtools points out that praise is a key motivator, as is team camaraderie. HR technology that facilitates peer recognition can be a powerful team-builder. As you accumulate management experience and know-how, you’ll become more valuable to your organization, as well as to your direct reports. Your team’s contributions will grow, and after some time you’ll be able to offer mentorship to other rising leaders. Take a deeper dive into the ROI of investing in social recognition technology by checking our webinar recording. Do you have any thoughts on this article? Share your comments below. It really doesn’t amaze me how some leaders come to feel they are a cut above. After all, who can blame them? As they climb the organizational ladder, the probability that they’re getting honest feedback rapidly diminishes. Certainly, those above them may still be candid, but those on the lower rungs, not so much. Few employees will risk calling out their bosses on their bad behavior or inadequate eﬀorts…and this is not good for the leader or the company’s bottom- line. The usual case is that remarks from those working beneath a leader tend towards the positive. Flattery, ego stroking or careful wording – whatever an employee feels is necessary to keep their job – is the route most take. Whether it be due to a socially ingrained deference to authority or out of fear of risking one’s job, most leaders simply do not get the feedback they need to become great at enlisting the best from their people. It’s easy to understand how, over time, a leader can completely lose touch with what people are really thinking. Senior leaders who have evolved double standards abound. For example, they might expect their team to return their phone calls or emails promptly, while they themselves no longer feel compelled to do the same. They may also come to expect much from others in the way of eﬀort but they themselves don’t feel the need to break much of a sweat. Due to the lack of honest upward-focused feedback, a leader may also have expectations disconnected from the reality of available resources. I’ve observed many situations where overworked, but committed employees, give it their all but still fall short of their boss’s requests. All this because no one wants to appear a ‘complainer’ or of somehow ‘not being up to the task’ by pointing out resource shortcomings. All this is both de-motivating and de-moralizing for employees. If people don’t feel that their boss is behaving with mutual respect and accountability, they’ll eventually head for the hills. Of all the reasons people leave companies, having a leader who they have a poor relationship with them tops the list. According to Gallup, 50% of employees who quit cite their immediate manager as the reason. While someone may initially be drawn towards a particular company because of the compensation, mission or growth opportunities, they most often leave because they don’t have a good relationship with their boss and not because of the pull of better oﬀers elsewhere. It soon becomes very clear why leaders need to get honest feedback along the way. Not only is it necessary to retain their top talent, but to do otherwise is to throw money out the door. Losing good employees costs time, talent and money. The stakes are fairly high when replacing a team member. The total cost of replacing an employee can be anywhere from thousands of dollars to 1.5 – 2x their annual salary. It involves much more than placing a new ad. The cost of recruiting including the advertising, interviewing, screening and hiring. The cost of onboarding a new hire including training and time from their new manager can be Over the course of 2-3 years a business may have to invest 10-20 percent of a new hire’s salary, or more, for training. Lost productivity – it may take a new hire 1 – 2 years to get up to the speed and eﬃciency of an existing employee. Lost engagement and cultural impact – other team members who see high turnover tend to disengage and lose their will to give their all. Both productivity and customer service can take a dive. Morale can also easily slide downwards…quickly. The elephant in the room is the fact that many companies simply do not have programs in place to train their leaders in the primary foundation of leadership: knowing how to get the best from others. All too often leaders are thrust into their new positions with minimal support. They are not given the training or feedback that it takes to engage and get the best thinking from their team…and this is bad for business. This baptism by fire scenario pushes new leaders to fall back on what they’ve seen modeled or may understand as ‘leadership’. One need only cast a brief glance towards the uncivil discourse within our political realm to see extraordinarily harmful examples of bullying and coercive leadership. But bad examples are everywhere. There are many examples of ‘command and control’ leadership styles throughout industry. This is why all leaders, both new and experienced, deserve and require training in how to do it diﬀerently. Companies need to teach and coach their leaders to take an active role in building engagement plans with their employees. They should hold leaders accountable, track their progress, and ensure they continuously focus on engaging their teams. A leader’s ability to engage their teams should be part of their formal performance review process. Research also makes clear that direct supervisors are the main components underlying how much discretionary eﬀort employees deliver to their jobs. An engaged employee puts their heart and shoulders into their work because they want to. This is where all of the magic happens. It is this extra eﬀort that makes the diﬀerence between acceptable productivity and stellar productivity, a mediocre product and a superb one, adequate customer service and outstanding customer service. Perhaps the most important piece in all of this is to realize that it may start with you. Take time to reflect on your own behaviors. Are you part of the problem or the solution? If you are a leader that has elevated yourself above your team, it may mean that you are drunk on your own kool-aid. This behavior is not helping to engage your team, produce the results you want, or work through the issues that you need to face. Being a cut above is not helping anyone. Plus, kool-aid really is for kids. Doug never colored within the lines as a child and believes in the healing power of dark chocolate. Despite being allergic to neck ties, he’s passionate about business. A Certified Executive Coach with global experience, he teaches leading edge approaches that help organizations create cultures that drive engagement, productivity and innovation, giving leaders and teams the skills and experience to contribute to the business in high impact ways. More information about his firm can be found at www.brockwayservices.com. Jacqueline Scafidi is on a team that leads company efforts which examine and evolve the employee experience in the workplace. Through her role with Zurich North America, she takes a human-centered approach towards recognition and rewards, volunteering, and targeted ways to engage employees in their work environment. She began with her current team in 2010, when Zurich invested in a growing team dedicated to community investment and the full employee experience. 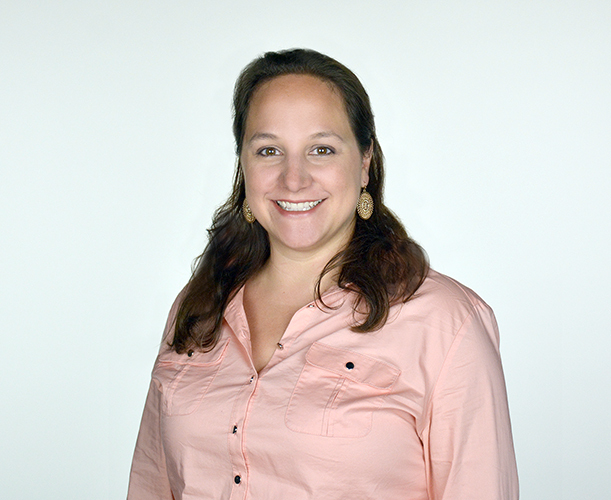 Jacqueline finds fulfillment in contributing to creative workplaces that engage a diverse set of thoughts and strategies, and has a passion to provide an approachable and distinct service experience for the customer and fellow colleagues. Her previous career incarnation included production stage management with the Chicago theatre community. Jacqueline was a graduate of Knox College in Galesburg, IL and feels love and support from her spouse, children, family and friends. We want to take a moment to recognize Jacqueline for her accomplishments in employee engagement. Below, she answers a series of questions, providing advice for fellow HR professionals and sharing her personal story. What interested you in a career in HR? I’ve always had an interest in the study and behavior of people. What influences our choices and our behaviors? What intrinsically and externally will motivate someone? I began with a focus on the charitable efforts of the company and our employees – coordinating volunteering and fundraising efforts. In time I began to take on programs and initiatives related to broader employee engagement. More recently I took over efforts on building a culture of recognition with our rewards and recognition strategy and programs. I enjoy the variance of a job role in HR – it’s never quite the same day. What is your biggest focus or goal when it comes to the employee experience? People matter. They are a driving force behind the success of a culture and of a company. Our focus is to ensure that our people feel that they matter and feel supported by our culture and our business. We look to involve our people in the evolution of the employee experience through their feedback and by inviting them to solution-orientated working groups to improve. What is your biggest culture challenge and how do you overcome it? The rapid pace of change is one of the larger cultural challenges I think any organization faces today. Technology, processes, the definition of your job role – every aspect is open to a more efficient or innovative way of working. To overcome the resistance to change it is important to communicate early and often, and to involve the users in the process from the beginning. If you explain why change is happening and how it can positively affect someone, you are more likely to experience acceptance and adoption. What is the key to boosting employee engagement across your organization? The key to boosting employee engagement across the organization is the support of management teams. Early adopters will always exist in an organization, but there are a majority of individuals that look to the leaders around them. We all know senior leadership should be role models for the rest of the organization. It’s the support and investment of mid-level leadership that will help an organization cross the threshold to true engagement. What is your favorite employee recognition moment at Zurich? At Zurich, my favorite employee recognition moment occurs each year when we honor and celebrate our KAMP Leadership Award recipients. On September 11, 2001, Zurich North America lost four colleagues in the World Trade Center attacks: John Keohane, Peggy Alario, Kathy Moran and Lud Picarro. Since 2002, Zurich has celebrated their lives by presenting the KAMP Leadership Award to deserving employee leaders. KAMP is an acronym representing each of our colleagues’ last names, but it also serves as a reminder about Keeping A Meaningful Perspective, something each of those friends and colleagues exemplified in their lives. The KAMP Leadership Award is a tribute to their spirit of courage, dedication, integrity and passion. There is a sense of duty and humility when I get to steward this award and experience we provide our winners. Where do you see the future of employee engagement heading? I think the future of employee engagement is one that responds to the changing work environment and adapts to the needs of the employees. Companies have evolved to be interconnected on global scales, now we must look at how we stay connected with the advancement of a mobile workforce that works anywhere, anytime. Across industries we need to rethink what it means to be engaged with one another and how those interactions will continue to be meaningful. The bottom line is that engagement affects our business and if we aren’t evolving to this new way of engaging, success will be harder to reach. What would be your top three pieces of advice for an HR professional who is looking to implement an employee engagement strategy at their organization? #1: Be intentional and specific on what your strategy should accomplish. #2: Embrace the ideas of your employees and have them be a part of shaping the outcome. #3: Be ready to evolve and learn. What’s next for Jacqueline? She and her team are doing some exciting work around the employee experience at Zurich. They’ve recently had the opportunity to listen to their employees in a more in-depth way and map out key moments that matter to their experiences from when they join to when they retire. These insights are allowing the Zurich team to take a deep, human-centered look at what contributes to their company’s culture and work environment and how they can continue to find ways to contribute enhancements. To learn more about the award-winning platform that powers Zurich’s recognition program, sign up for a demo of Achievers today. Kellie Wong is a Content Marketing Manager for Achievers. She manages The Engage Blog and produces a range of marketing content. In addition to being the final editor of all blog content for The Engage Blog, she also manages and maintains relationships with 45+ writing contributors. Connect with Kellie on LinkedIn. When you think of a great leader or mentor who has had a positive influence on your life, how would you describe that person? Were they strong, fearless, driven, smart or were they a good listener, coach, understanding, warm, funny? We know that when leaders have too much heart, people walk all over them. When leaders have too much edge, people fear them. Can you have a combination of these traits – a heart of empathy and understanding with a strong edge of accountability and fear? The highest performing leaders know the answer to this question, and work on it daily. Maybe you are a leader who knows the answer or wants to take your leadership performance to the next level. You might have already read several leadership books, watched numerous TED talks, and attended countless training programs. The real question you need to ask yourself is, “Do you work on your edge or your heart?” Niccolo Machiavelli, one of the most famous Italian philosophers and diplomats of the Renaissance period said, “It is better to be feared than loved, if you cannot be both.” In contrast to this viewpoint, today’s leadership research identifies the most effective leaders have a combination of a heart of compassion and an edge of accountability often referred to as “steel and velvet”. It is this healthy combination, that is developed over time, that leads to leadership success. Starting with warmth, and not fear, is essential to successful leadership performance. People need to like you first before they follow you. If you want to influence another person, you must connect with them off the bat. It doesn’t matter if you have a title over someone or not; being a warm person facilitates a trusting environment with open communication and ideas. Your body language – a smile, an open gesture, a positive nod – can show people you are pleased to be in their presence and are listening and attentive to them. According to an article by Amy Cuddy, Matthew Kohut and John Neffinger in Harvard Business Review, it states, “The best way to gain influence is to combine warmth and strength—as difficult as Machiavelli says that may be to do. The traits can actually be mutually reinforcing.” Feeling a sense of inner strength helps people to be more open and less aggressive in stressful situations. When we, as humans, feel calm and confident, we project authenticity and friendliness. It is challenging balancing heart and edge, especially because many of us are born or raised with a certain style of leadership that naturally favors one over the other. Self-aware leaders know that changing or improving a behavior takes time and can be very challenging. We form habits and negative self-talk that prevent us from making shifts in our leadership style for the better. This is a true test of Emotional Intelligence (EI). Are you able to manage your emotions and move away from old habits that might sabotage your highest performance? An emotionally intelligent leader can do this and is open to being vulnerable and receiving feedback without becoming defensive. Even when it is extremely uncomfortable, effective leaders know how to engage with others and prioritize their team to achieve overall success and happiness. Research identifying the most important leadership qualities based on a study of 195 leaders in 15 countries over 30 global organizations highlights the importance of having both heart and edge. What does leadership heart and edge mean? How do you show up with a combination of both even if you have a natural tendency towards one? How do you utilize EI in your leadership style? Start by practicing self-awareness and identifying if you are a leader with more heart or edge. If you don’t know, ask others on your team. They will tell you. Question if everyone on your team is performing to their highest performance. How can you set tougher short-term goals and push your team out of their comfort zone? Remember to stay strong and consistent in your leadership direction even if people complain or make excuses. Hold people on your team accountable. Allow them to have a voice and feel valued but be clear in your feedback. Have courageous conversations in a timely manner and preferably in the morning. If you are afraid you are going to hurt a team members’ feelings, quiet that voice and speak anyway because your feedback is valuable to their long-term success. Create a culture where everyone feels their opinion matters and there is healthy conflict. The thing you should most fear is everyone agreeing with you. Learn how to place empathy at the center of all leadership and design decisions. You will supercharge your ability to produce breakthrough innovations. Listen more and try not to jump to a solution without hearing others’ opinions. Invite the person you might not be the biggest fan of, but has a stake in your company’s success, to your next meeting. You may even want to consider asking them to lunch. In my leadership coaching and training experience, I see all types of leaders who each have their own set of challenges. Great leadership starts with you and your own authentic self-awareness. Becoming a great leader is something that evolves over time. This is hard in practice and needs to be part of your proactive growth to leadership excellence. Remember, it is this balance of heart and edge that is the key to becoming a high performing leader. Don’t give up on trying to achieve it and continue to practice EI because it really makes a difference on leadership performance. Come see me at ACE 2018 from October 23-24 in Toronto to learn more about EI and leadership. Bobi Seredich is a recognized speaker, author, trainer and successful entrepreneur specializing in leadership development. She has spent over 23 years of her career dedicated to creating, directing, writing and presenting leadership programs for top companies in the U.S. and around the world. Bobi is the co-founder of the Southwest Institute for Emotional Intelligence and Managing Partner of EQ Inspirations. In 2001, she founded Equanimity, Inc. also known as EQ Speakers – a speakers’ bureau and leadership training company. It fast became a top speaker bureau that booked hundreds of speakers with large Fortune 500 clients. EQ Speakers was sold in 2012 and continues to be a leader in the industry. Her book, Courage Does Not Always Roar – Ordinary Women with Extraordinary Courage, was published by Simple Truths in the spring of 2010. The book is a collection of her experiences and stories of women who have had the courage to overcome very difficult life events. Her passion is to guide individuals and organizations to a higher performance level through her own business knowledge, inspirational stories and leadership emotional intelligence training. Bobi lives in Phoenix, AZ with her husband, Roy, and 6-year old twins, Alex and Gia. Lack of Impulse Control: Is It Preventing Leaders from Engaging with Their Teams? It all started with a client of mine whose leader had expressed frustration with her team members for being too relaxed and unprofessional. My client was the Chief Operating Officer (COO) of a large healthcare company with over 600 team members. She worked closely with the Chief Executive Officer (CEO) who was a successful leader and had been with the organization for over 15 years. One morning, the CEO became really frustrated with a few employees who were eating breakfast at their desks, which seemed to exacerbate the unprofessional work environment she was observing. She felt this was a time-waster and team members were losing productivity. She lacked patience and decided to send an email to the entire company letting employees know they could no longer eat breakfast at their desks. Instead, team members had to eat before work or in the cafeteria. She did not inform her COO or the Human Resources (HR) department she would be sending this email. What effect did the CEO’s actions have on employee productivity that week? Her intention was to increase productivity, but her impulsive actions resulted in a decrease in efficiency. Many employees were confused by her email, and HR was receiving calls for clarification, with employees wondering if protein bars or nuts were considered breakfast items. Other employees were pregnant or had health issues, would they be penalized if they had food at their desks? They felt they were being discriminated against. Was this leader self-aware enough to recognize her patterns of behavior that led her to act impulsively? Was she able to have difficult conversations? Did she recognize how her behaviors impacted others? The answer to all these questions was “no.” This leader was not self-aware and was not able to understand the negative impact of her actions. What could this leader have done better? She could have had a conversation with those few employees she felt were not being productive instead of sending a group email. Impulses such as the CEO described above can be perceived as a lack of control, maturity, or business savvy. This type of behavior often derails the offender as it can lead to termination or reduced opportunities for advancement. How many of us have observed another team member engaging in an activity that we believe to be unproductive? Have you read an email, and immediately became defensive about the content or tone the sender was using? Then you impulsively decide to respond immediately and give your feedback via email, or even worse hit ‘reply all,’ and later regret what you said or wrote in that email. Unfortunately, you can’t take it back. It felt good in the short-term moment but left you with regret in the long-term. With the use of email, Twitter, and texting, immediate gratification and ease of use prevents you from delaying or fully thinking about a response to another person’s communication. Research shows smart phones and other devices make us less assertive and cause us to “play small” and not stop to reflect how this impacts bigger life plans and goals. What Is the Definition of Impulse Control? Impulse control is one of the core competencies of emotional intelligence (EI) and is defined as the degree to which a person can control the need for immediate gratification. It may be the most significant indicator of a person’s future success in the workplace or adaptation in society in terms of building and maintaining relationships with others. The impact of a lack of impulse control in the workplace is generally significant whether it is a one-time occurrence or a pattern of behavior. When you act on an impulse that leads to a negative outcome, it can lead to serious consequences that are life changing and result in forming a negative reputation. On the other hand, when you have a positive outcome, it gets a different type of attention. It can look like you are brilliant, and your reputation is elevated as a leader and a managed risk taker. What Does Research Reveal About Impulse Control and Life Success? For years parents have been testing their young children on impulse control based on the findings in The Stanford marshmallow experiment on delayed gratification in the late 1960s and early 1970s, led by psychologist Walter Mischel. More recently, Amy Chua and Jed Rubenfeld have re-examined impulse control and America’s “culture of entitlement and instant gratification” in their book, The Triple Package: How Three Unlikely Traits Explain the Rise and Fall of Cultural Groups in America. Both research studies reveal impulse control is a key driver of better life outcomes as measured by better academic performance, higher SAT scores, upward mobility, and professional success. What prevents you from being present when you are engaging with another co-worker and not getting distracted? Is it emails, false deadlines, text messages, phone calls, web surfing, or interruptions? How can you not give into the power of temptation and stay more in the present moment? When we lack impulse control, it takes us to a place we were not planning on going. We feel hijacked in the moment – our cognitive brain is no longer in control and our emotional brain is running the show. On average, we have 60,000 thoughts a day (according to research by Dr. Fred Luskin of Stanford University) and only about 8-9 % are present-moment thinking. This is referred to as a “monkey-mind,” which can lead to impulsive behavior or emotional reactions when our emotional brain hijacks our thinking brain especially when we feel stress or triggered. This is called an amygdala hijack. When the emotional part of your brain, your amygdala, is hijacked, your oxygen and blood flow move away from your thinking brain to your larger muscles, so you can react or get out of a dangerous situation. That is why you can’t tap into the best of your cognitive brain to see all variables and make a better rational decision. The word “hijacked” is a strong word, but it feels sudden, unexpected, out of control, forceful, against your will, taking you someplace you were not planning on going. You feel more certain and things are more black and white. You are right, and the other person is wrong. You lose perspective to think clearly. What Does Impulse Control Look Like in the Workplace? As adults and business leaders, how can we improve our impulse control to engage better with team members and become more focused, productive and creative? Research findings reveal leaders who can manage strong emotions when feeling stress or pressure, while maintaining a healthy sense of humor, are more successful in building stronger relationships, being creative and meeting professional goals. The more self-aware you become about your own emotional triggers and how you manage your impulse control, the greater the chance to avoid inappropriate outbursts and poor decisions. Many times, you learn to control your impulsive behavior after an unfortunate event where you lost control and had to pay a big price. Hindsight is always 20/20. When you have a moment to look back at what you said or did, you have a better understanding of how you were triggered and how your actions impacted the situation in a negative way. You may take appropriate steps to limit the damage. You cannot change another person or situation, but you can manage how you choose to react or respond to a situation. You can take charge of your impulse control. As a result, you can choose to “play big” and achieve more happiness, engagement and success in your personal and professional life. Stop and breathe before you react to a situation or send an email. Remember that instant gratification is short-lived and is about “playing small.” You want to “play big” and maintain a healthy sense of humor. Evaluate options – no response is sometimes the most powerful response. Listen to hear instead of listening to respond to someone. Become aware of distractions that are preventing you from listening. Don’t feel the need to respond to every email or text immediately. Leave 10-minutes earlier to an appointment to give yourself a buffer and practice mindfulness if you arrive early. Avoid overpromising and under delivering and practice “present moment” thinking. Are you looking for more leadership tips? Discover how to effectively listen to your workforce with Achievers’ white paper on Taking the Pulse of Employee Engagement. Her passion is to guide individuals and organizations to a higher performance level through her own business knowledge, inspirational stories and leadership emotional intelligence training. Bobi lives in Phoenix, AZ with her husband and 6-year old twins, Alex and Gia. https://www.achievers.com/blog/wp-content/uploads/2030/08/banner-2.png 321 845 Bobi Seredich /blog/wp-content/uploads/2015/06/engage_logo-300x1021-300x102.png Bobi Seredich2018-07-10 08:00:232018-07-23 15:33:24Lack of Impulse Control: Is It Preventing Leaders from Engaging with Their Teams? According to the Work Institute’s 2017 Retention Report, 75% of the causes of employee turnover are preventable. That’s excellent news for your HR budget, as the cost of replacing entry-level employees alone hovers near $4,000 per position. A small change in human behavior can be enough to indicate damage in employee motivation. Yet, detecting early signs of employee disengagement is never an easy task. It requires excellent observation skills and strong empathy to respond in a way that restores engagement across your organization. At a time where barriers between leaders and employees are at an all-time low and with 70% of employees wanting to spend more time with their manager, simple actions stemming from emotional intelligence and intuitive leadership are powerful enough to correct a subtle motivation drop. 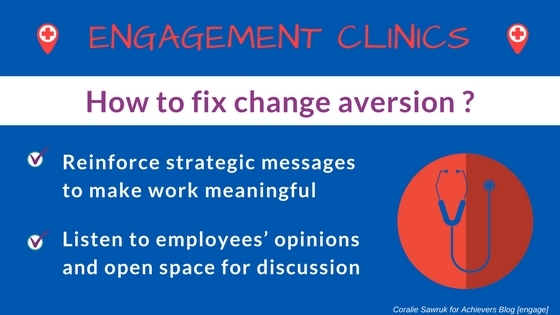 Here’s engagement clinics to discover how you can address early signs of employee disengagement. Note: All names have been changed for privacy considerations. Efficient, committed, and highly engaged, Jane was the next talent to accelerate. Jane’s manager assumed that since she was a high performer, she didn’t need much handholding to sustain her performance. But Jane’s sense of achievement dropped in the course of a few months, an early sign of employee disengagement. The challenge for any leader is to adjust space for employees to be empowered. For a high performer, too much attention to what she does is micro management. But attention to how she does it and why she does do it can give off the wrong message. As any other employee, high performers need frequent recognition to protect their sense of belonging. They want strong feedback to reach excellence in their work. And they crave coaching and mentoring to level up their “soft” skills. After all, 68% of millennials who intend to stay in their company for the next 5 years are involved in mentoring programs. I remember very well Simon. Simon was the go-to expert in his area. Considering his immense knowledge and potential for relationship-building, I assumed his next step was to develop his leadership skills. What I underestimated at the time is that Simon had little appetite for stepping out of his comfort zone. Early signs of employee disengagement showed up as plain resistance, from “I’m not sure I can do it” to “this is completely useless!”. Each leader should pay extra attention to words of resistance. Resistance is the seed for limiting beliefs that can become given realities for the employee, and get in the way of performance. 80% of employees would work longer hours for a more empathetic employer. An emotionally intelligent leader knows that a huge part of the job is to attend to team members and support them towards having a delicate balance of confidence and performance. Performance starts with clear goals. Confidence grows when you support your employees as they achieve those goals, and show them where their true potential is. How often do you try to communicate a message to your team and some still don’t get it? Frustrating, right? It’s nothing else than human nature. Driven by fight or flight responses, humans are not wired to navigate change easily. If you try to suggest change towards the way your team behaves, you can might be criticized or worse, ignored. It could be tempting to take criticism as “venting moments”. But if left unaddressed, those early signs of employee disengagement can lead team members to question if their values are still aligned to the company’s mission and values. According to Deloitte’s Talent 2020 series, “performing meaningful work” is one of the top three motivational drivers for employees. For team leaders, it could be as simple as making top level communications relatable for everyone and taking the time understand what type of work each of your team members enjoys doing. In addition, listening to your employees on a daily basis fosters a safe space for them to express their opinion. With the availability of advanced HR technology listening to your employees on a daily basis is now easier than ever. Check out intelligent active listening interfaces such as Achievers’ Allie™. With Allie, you can get clear insights on your employees’ pulse and receive honest feedback. One of those “human skills of the future” is to ensure your leadership includes the best employee engagement and retention tactic: fostering human connections so that you can spot (and address) early signs of employee disengagement. Do you want to learn more about employee disengagement? Check out Achievers’ white paper, The True Cost of Employee Disengagement. Are you free in October? Discover where the future of HR technology and employee engagement is heading by attending Achievers Customer Experience (ACE) 2018 in Toronto, October 23-24. Get the early bird rate and save $200 off the regular rate today. Buy now here. It’s an open secret leaders are often poor communicators. “I’m not a people person” or “I’m not good with words” are often cited as reasons for avoiding conversations with staff and colleagues. Even though it’s well documented employee performance increases when leaders give staff feedback, many in authority choose not to put in the extra effort. Why is this? In my experience, unrealistic expectations are partly to blame. Rather than telling leaders who don’t talk to their staff to have more frequent conversations, it’s time to look at what’s stopping these professionals from communicating in the first place. In fact, let’s call a do over. Here’s a look at the three beliefs that make it difficult for leaders to succeed, and three new approaches to try instead. Unless you serve as a spokesperson for your organization or are a member of the C-Suite, it’s not actually necessary for a leader to be an “effective communicator”. Communication is mistakenly used as a catch-all term that consists of three different styles of conversation: talking, conversing and communicating. These words are used interchangeably, but in the workplace they are actually quite different. Talking does not require an agenda or a call to action. It’s a free flowing exchange of ideas such as discussing the weather. Conversing, on the other hand, is the act of discussing and seeking feedback on a particular topic with the end goal of achieving consensus. So what is communicating? It’s the art of persuading someone to accept your idea or key message. It may or may not include a two-way dialogue as a means to prove the merit of your argument, which is different than conversing when you actively seek another person’s point of view. Communicating is what I am doing right now by inviting you to see my perspective in this blog. The job of a leader is to maximize each conversation rather than rush to get it over with. Staff are hardwired to need the neurological high that comes from verbal discourse. It’s enough, and far more realistic, for professionals to be skilled at conversing with their staff and colleagues. There’s a general expectation that adults, and leaders in particular, should be able to communicate with one another. But the reality is “Although we are born with the gift of language, research shows that we are surprisingly unskilled when it comes to communicating with others,” says Andrew Newberg, M.D., and Mark Robert Waldman, authors of Words Can Change Your Brain: 12 Conversation Strategies to Build Trust, Resolve Conflict, and Increase Intimacy. Sure, most leaders learn communication skills through life experience, but this can also cement their fear of talking to employees. Ellen Taaffe, a clinical professor of leadership at the Kellogg School, says “most people are afraid to give feedback because they don’t want to come off as mean, they don’t want to be disliked and they certainly don’t want to hurt anyone’s feelings.” Being a professional does not erase a person’s fear of causing social pain for someone else. Let’s encourage a leader to use these feelings to become a more empathetic conversationalist. Everyone wins if a leader can speak in a way that is clear and kind. There are only ever three ways to respond when someone speaks to you – defend, dismiss or validate. It’s tempting to try and help solve a situation, offer an opinion or ask for more detail. However, leaders are well served to validate what an employee says before commenting. Imagine a team member came in to share an idea they are excited about. How do you think it would go over to lead with, “I can tell you are really excited about this idea. Let’s hear it.” Instead of, “Sure I have a few minutes.” This approach will probably feel unnatural at first but the payoff will be worth it. Martin Seligman, author of Learned Optimism, has proven humans become passive when they experience failure and feel like they have no control. This can lead to a constant expectation of failure and the development of “learned helplessness.” It’s no wonder some leaders dread having a conversation if their experience has told them it’s not likely to go well. But avoiding conversations with staff and colleagues is not a viable solution. A better game plan is to feel prepared for the dialogue that might come your way. The fear of saying the wrong thing is greatly reduced when a leader prepares for a conversation. Professional communicators are taught to follow a three step plan before ever saying a peep. The process – think, plan, write (or say) – gives the mind time to be creative, make unlikely connections and become comfortable with what is going to be said. Look at it this way – what’s the more effective way to pack for a vacation: a) make a list and pack accordingly or b) close your eyes and throw things in a suitcase and hope you did a good job? Work conversations require preparation. This may seem hokey but five minutes to collect your thoughts and jot out a few notes can make a world of difference. It’s also worth remembering everything a leader says will be heard by an employee as a verbal report card. Staff are likely to analyze the conversation and decode any hidden meanings. Be thoughtful about your word choice and ask more questions than you make statements. Changing your communication style takes time. Here’s one shortcut to get you started: observe your colleagues’ conversations and notice their good (and not so good) habits. Tune into what’s being said around you and observe what’s successful. This will help your brain want to replicate what’s proven to work. To learn more about how to effectively listen to your workforce, download this white paper: Taking the Pulse of Employee Engagement. And if you’re looking to improve the employee experience for your team, check out another great read covering Personalization: The Missing Link in Employee Experience. Janet Hueglin Hartwick is a communication coach, trainer and speaker. She is the founder of Conversations At Work, an evidence-based communications training program that helps leaders manage today’s emotionally engaged workforce. Janet is also is also the President of Soilleirich Communications Group, a consultancy that specializes in corporate and employee communications. When a critical piece of business technology suddenly stops operating properly, your first reaction is to find the problem and get it up and running at full-capacity, as soon as possible. Yet, when it comes to your most valuable business asset, your employees, many company leaders aren’t as quick to react. Unfortunately, according to a new SHRM report, 38 percent of employees feel overwhelmed by how much they have to get done at work. What’s more, a January 2017 report by Kronos and Future Workplace found that 46 percent of human resources professionals blame burnout for up to half of their staff quitting each year. The issue of an overwhelmed and burnt-out workforce is nothing new — and that’s the problem. So, we went directly to the source to find out where the disconnect is. When work becomes overwhelming, those who feel unappreciated will disengage even faster, increasing their chances of looking for new work. In fact, 55 percent of North American employees noted a lack of recognition as one of the main reasons they are considering changing jobs, according to our latest report. Of course, more and better recognition won’t decrease your team’s workload, but it will make them feel appreciated for their contributions and perhaps more motivated to do their best. These shifts can enhance productivity, lightening the burden of an overwhelming workload. This hard-hitting word isn’t just for sound effect. For CHRISTUS St. Michael Health System’s employees, KABOOM, their employee recognition platform, is now a way of life. The CHRISTUS team is dedicated to compassionate care, especially for those who are poor and underserved. With such an intensive mission, it’s easy for employees to feel overwhelmed. Seeing the need for more employee support, company leaders implemented an online, points-based social recognition solution. Leaders and employees now both celebrate in-the-moment acts of accomplishment and dedication by sharing peers’ specific actions and rewarding them with points. These recognition points accumulate and employees can then use them toward a reward they desire. The KABOOOM program was a hit for CHRISTUS St. Michael. In fact, the company saw more than a 10 percent increase in employee engagement thanks to this recognition tool. Passionless employees are disengaged employees. It’s up to leadership to understand what drives a strong connection between employees, their individual roles, and the company’s mission and goals. Clarifying and solidifying this connection unquestionably increases retention. In fact, according to our previously mentioned report, 74 percent of employees note that making work more interesting and inspiring increases the likelihood that they will stay with an organization. Go against company norms to change the way employees interact with one another and approach their daily tasks. To form a true connection, many employees need to step out of constraining routines. Rather than hosting traditional weekly or monthly meetings, encourage employees to keep discussions ongoing via online forums. This approach to communication not only saves time, but also allows employees to stay connected with peers and their work without being interrupted by lengthy, in-person meetings. Some employees may need a stronger disruption from the daily grind. Consider offering regular employee education hours to help employees step out of their comfort zone and reconnect with their roles, peers, and the company as a whole. During these hours, employees can job shadow a co-worker, take a course, or draw inspiration from a favorite podcast. Each of these tactics offers a unique way for employees to find a new, interesting take on work. Your team is full of unique, diverse individuals — and that’s what makes a company successful. Unfortunately, many employees have limited flexibility when it comes to when and where they work. This constraint can result in a lack of creativity and efficiency – and even a decrease in retention. In fact, according to our report, employees are motivated to stay on board when they have more time off (57 percent) and have the ability to work remotely (55 percent). Create a unique employee experience to enhance productivity and keep employees from feeling overwhelmed. Start by surveying your team to find out why they’re overwhelmed, when they feel most productive, and where they’d like to work, or what atmosphere increases their innovation. Based on results, start changing up the employee experience. If employees say they need a more home-like atmosphere, brainstorm as a team to identify ways to make that shift. Additionally, consider offering one or two days a week during which your team can work from wherever they want. These are great tactics to start with but it’s critical that you don’t stop here. Continuously survey employees about their connection to work, productivity, motivation, and emotions. Look for trends in employee engagement and compare engagement scores to the days employees are able to work when and how they want. Keep altering and communicating with your team until you find something that works for everyone. 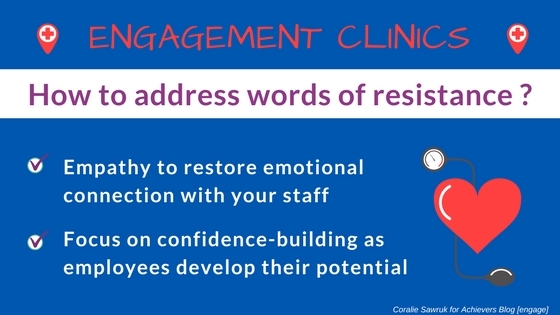 How do you engage your team when they’re feeling overwhelmed? Let us know! Find out more about your employees’ needs and expectations by downloading our report here. Are you free in October? Come see me and discover how to increase employee engagement by attending Achievers Customer Experience (ACE) 2018 in Toronto, October 23-24. Get the early bird rate and save $200 off the regular rate today. Buy now here. Dr. Natalie Baumgartner is the Chief Workforce Scientist at Achievers, an employee engagement platform specifically designed to align everyone with business objectives and company values, driven by recognizing shared victories every day. When I think of optimism and resiliency in people, I think of our “greatest generation” and people like Louis Zamperini. Zamperini faces extraordinary trauma, as depicted in the book Unbroken, and he has leadership lessons for all of us. If you haven’t read the book or seen the movie, Unbroken, you must add it to your list. Zamperini’s story is unbelievable that one person could survive so much and live a healthy life to age 97. He was born in 1917, and he competed in the 1936 Olympics as a champion distance runner, and then joined the American Air Force at the outbreak of the second world war. 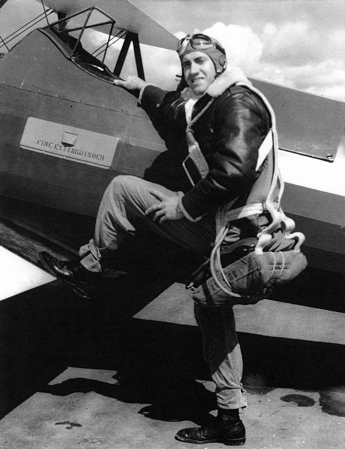 In May 1943, his plane was shot down over the South Pacific, killing eight of the eleven crew and leaving Zamperini and two others stranded in a tiny life raft. Enduring the loss of their friend Mac from starvation, machine gun fire from passing Japanese bombers and shark attacks, Zamperini and pilot Russell Phillips held out for 47 days. When they finally reached the Marshall Islands, both were too weak to stand. Little did they know, that their struggle had only just begun. They were rescued by a Japanese warship and sent to various concentration camps, where they suffered sadistic beatings and threats of death daily until their release in August 1945. The physical and psychological trauma that Zamperini endured was unbearable, and most of us can’t imagine. He did return home and suffer from some depression and nightmares. But he went on to start a new career as a motivational speaker promoting the power of forgiveness. You may never experience what Zamperini went through, but there are days when you feel like you are being attacked, surrounded by sharks and need someone to help you. In business and life, rapid change is the normal and it comes in waves, hurricanes and now in “bomb cyclones”. Today, leaders and their organizations are forced to address increasingly complex challenges as well as grow with uncertainty. Speed and agility are not the only edge. The need for effective leaders that are resilient, optimistic and emotionally intelligent is more important than ever. The definition of optimism: The hopefulness and confidence about the future or the successful outcome of something. The definition of resilience: The capacity to recover quickly from difficulties; toughness. Our leaders need to learn and understand better how to be resilient and optimistic especially when they are facing pressure and challenges. 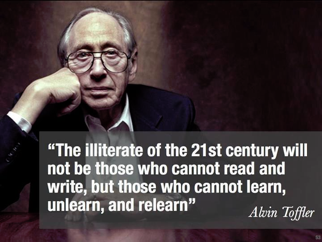 Our view of the world and daily attitudes and behaviors are learned patterns to which Toffler’s insight applies with earnestness — the capacity to “learn, unlearn, and relearn” emotional behaviors and psychological patterns will be the edge leaders need to survive and thrive in this ever-changing crazy world. It is a good time to have a healthy dose of optimism whether you are struggling with your business, managing and motivating your team, negative politics, economics, finance, relationship setbacks, parenting challenges, health issues or an overall feeling that life is not turning out the way you thought it would. Sometimes, we need to change the lens that is viewing our present moment and future and ask a few questions about our own level of optimism and how we are managing difficult situations and daily setbacks. How would Louis Zamperini view this problem and what would his attitude be? Was it me or something outside of me? Optimists believe it is something outside of them. Will it affect everything I do? No, optimist believe it will be short-lived not long-lasting. Will I change my game and adapt and do something different? Yes – changing your game is the answer. Optimists don’t give up. Louis Zamperini never gave up! He continued to be an optimist until the day he died. We can all learn from his story and from the research of Martin Seligman on optimism. Remind yourself when things are tough and the pressure is on, we have the capacity to be resilient and optimistic and don’t let anyone change your mind or influence you negatively. To learn more, check out my blog post on Why Self-Esteem is Critical to Successful Leadership. Are you looking for a great eBook? Check out Achievers newest eBook highlighting 3 ways to make recognition an everyday event. Bobi Seredich is a recognized speaker, author, trainer and successful entrepreneur specializing in leadership development. She has spent over 20 years of her career dedicated to creating, directing, writing and presenting leadership programs for top companies in the U.S. and around the world. Her passion is to guide individuals and organizations to a higher performance level through her own business knowledge, inspirational stories and leadership emotional intelligence training. Bobi lives in Phoenix, AZ with her husband and 5-year old twins, Alex and Gia. Helping companies and employees feel more connected, Limeade and Achievers have joined together to create a seamless, simplified employee engagement experience. Read more about the partnership announcement here. At Limeade, we believe true engagement happens when people feel good and have a sense of purpose. We define employee engagement, or “Big E” engagement, as the extra energy and commitment that comes from this sense of purpose and connection. We look at engagement through the lens of well-being because our research shows that well-being is a precursor to engagement — and how your organization supports well-being is a critical part of the equation. After a deeper look into our research, we found that the single most important way to support employee well-being is through immediate managers. This year, make sure your managers are supporting employee well-being by following our six tips. Schedule frequent 1:1 meetings with your team members. Listen and invite an open dialogue to cultivate discussion about their projects, tasks or roadblocks. Be a role model for well-being improvement by communicating your own well-being priorities with your teams. Tell them about your goals and the steps you’re taking to reach them. Send frequent messages of support and encouragement to your teams to call out their great work. Thank you cards or real-time recognition, whether monetary or social, during team meetings are a great way to show your employees you care. Get to know your team on a personal level in order to understand what matters to each employee. Some employees will want to focus on work-related topics while others will open up about their goals and challenges. Invest in your employees for the long-term by providing career development or cross-functional training. Side projects that help them develop new skills will show them you care about their development. Assume positive intent from your employees and give them more control over their schedules. It’s about trusting employees to get their work done on a schedule that works for them. It’s time for managers to transform themselves into leaders, and it starts with supporting employee well-being with these six tips. Do you want more tips and tricks? Check out this full list of steps to help elevate your authentic commitment to employees. Do you want to learn more about Achievers and Limeade’s partnership? Watch the video below to see the partnership in action. Create a connected employee engagement experience with Achievers and Limeade. Limeade is an employee engagement platform that builds great places to work by improving well-being and strengthening workplace culture. The importance of employee recognition and engagement cannot be overstated. Companies everywhere are shelling out billions every year for HR programs designed to enhance their office culture and improve employee productivity. Yet, according to Gallup’s 15-year study, the percentage of American workers that are “actively engaged” at the workplace remains fairly stagnant, with an average of just around 32%. This begs the question: why are some employee engagement programs working while others aren’t? Designing an engaging office culture requires more than just planning birthday parties or patting a worker on the back for a job well done. Engagement strategies can’t be forced; they need to be implemented carefully and encouraged in order to make an impact. So what should you do to get your workforce more involved? If you’re looking to build an engagement-driven office culture, check out these four common traits of successful culture initiatives. Teams look to their leaders to set examples of proper behavior. The effect management has on employee engagement and motivation is astounding. According to Gallup’s State of the American Manager Report, leadership has the strongest impact on employee engagement levels in a workplace. Management is responsible for 70% of the variation in employee engagement levels, and workers who had proactively engaged managers were nearly 60% more likely to be engaged themselves. There is no denying that managers are largely responsible for the office culture of their organization, and therefore, it is up to them to make the necessary changes for improvement and become employee engagement champions. When they strengthen their leadership practices and become more hands-on, teams will likely follow suit. One practice that leaders must absolutely do away with is abusing company talent in any way, shape, or form. Only about 20% of office workers feel that management motivates them to do their best. Mismanagement, poor job design, or unfulfilled expectations are some of the leading causes of employee disengagement. Many workers feel that managers misuse their skills in the office by not providing opportunities to use their key skills. Underutilization or overworking employees are both major mistakes that can cause frustration, disengagement, and eventually, higher turnover rates. Leaders with poor communication skills, micromanaging tendencies, or other negative traits can quickly discourage employees and create negative behavior among the team. In order to push for a more engaged environment, leadership must first establish a set standards and examples for others to follow. We all have a desire to fit in with our peers, and it can be very frustrating and disheartening to new hires who just don’t quite mesh with the new company culture. In fact, IBM’s study found that 20% of workers left a position because they did not fit in with the company culture. Culture fit is critical to employee engagement and happiness, especially when it comes to new hires. By focusing more on culture fit from the very beginning during the recruiting process, employers will find it easier to boost employee engagement levels while simultaneously decreasing turnover and increasing retention. HR technology plays a huge role in employee engagement, and it can simplify the tedious process of finding new talent that are great culture fits. If you really want to be more accurate at finding employees that fit your culture, you can incorporate more data-driven insights into your hiring process. For example, there are certain HR tech platforms out there that can track applicant’s personality traits, problem solving abilities, and even professional values. When you think of companies with great employee engagement programs, one that probably pops into mind is Southwest. The low-fare airline has really set the bar for employee enthusiasm and satisfaction levels by finding new ways to get the team involved with the company. When the business decided it was time to redesign company uniforms in 2016, they allowed employees to select the colors, fabrics, and details. All employees were then able to vote for a final decision. The airline’s founder, Herb Kelleher, understands the importance of building a business that values everyone’s opinions and participation. Collecting honest feedback and suggestions is the key to building an office culture of innovation in which everyone can feel open to participate. An engaged employee often feels connected to their organization because they understand the unique role they play in its success. 69% of the healthiest and happiest organizations in the country offer programs for professional skill development, proving that a little extra motivation can make all the difference. Encouraging employees to work on things they are passionate about not only provides satisfaction, but also helps them achieve their fullest potential. Innovative workplaces that encourage employees to get involved with passion projects will build an office culture that thrives. Google is famously known for encouraging employees to pitch their own business ideas and even pursue personal projects to fuel innovation and engagement. Finding ways to support non-profits or good causes is more than just a nice thing that businesses can do. Fortune reported that up to 59% of respondents to a survey agreed that they would prefer to work for a company which supported a charitable organization over one that didn’t back any, and many were more likely to buy products from such businesses as well. More and more businesses are urging their employees to get involved with charities. Tom’s of Maine is a great example – they require employees to spend 5% of their paid work time volunteering. Employee engagement shouldn’t just run from Monday to Friday, 9 to 5. It must be practiced beyond the office, too. Keeping everyone inspired to develop, grow, and improve, even after they’ve clocked out, can help everyone in the business aspire to be something better. Businesses that prioritize employee engagement will create more enjoyable office cultures for everyone. Leaders must set the standards, but it is also important to build a strong team from the bottom up. Getting every single person involved by listening to their opinions and encouraging personal interests can help keep the momentum going. Building an amazing company culture takes time, but the rewards are well worth the wait! To learn more about the importance of strong culture, check out this white paper on The True Cost of Disengagement. Start building an engagement-driven culture with Achievers and Limeade. Watch this short video to see the partnership in action. Lori Wagoner is a market research consultant. She advises small businesses on new ways to find local and national business. She’s an avid blogger and writes for sites such as Small Business Can, Tweak Your Biz and Customer Think. You can catch her on Twitter @loridwagoner. It is vital that new employees have a clear understanding of their specific goals and objectives at your company. Recruiting new employees without clearly spelling to them what is required will only lead to confusion and lower productivity. When onboarding new hires, be very clear about your onboarding goals and expectations. Strategize on how you can build transparency in your workplace and onboarding programs. A fun and easy way to get a new employee up to speed and on target with their onboarding goals is by pairing him or her with a mentor within the organization. This will help them stay engaged in all activities that take place and have someone to turn to when they have questions. It not only helps both parties build a work relationship with another, but adds to a more engaging work culture. Choosing a mentor who is well versed in the same career path or team projects would be an effective way for employees to collaborate closer together early on. New employees and their mentor may meet once or twice a week to discuss the new hire’s progress and how they are adjusting to the new job. How an employee engages and interacts with rest of the team is very crucial. As part of the Human Resources department, you have a role to play in helping to foster strong relationships amongst coworkers. Interworking relationships is a huge part of work culture and leadership’s relationship with employees in particular has a strong impact. Leaders need to lead by example and have the responsibility to live out the company’s values daily and communicate with those around them. When employees and leadership develop a strong relationship, new hires gain an instant new sense of teamwork and employee alignment. When new employees feel free and comfortable to reach out to co-workers because of the healthy professional relationships presented, especially for the first few weeks, the learning process becomes easier for them to adapt to their new surroundings and team members. New employees should be quickly introduced to your HR programs and HR tech platforms. For example, if your company has an employee recognition and rewards program, make sure new hires are aware of it and know how to use it as soon as they start. Employee recognition programs connects employees and allows them to recognize each other for hard work. Programs like this not only provide something fun for new hires to become accustomed to but also instantly immerses them into the company culture and fosters a positive work environment. Receiving public recognition on a digital, easy-to-access HR tech platform boosts employee happiness and gives employees insight on what others are working on and accomplishing. It’s HR’s job to not only implement HR tech platforms and programs correctly but also keep promoting them to new hires and existing employees so there is optimal use and employee engagement. Employees want to feel like they can be honest and heard at their company. Asking for continuous feedback and reviews are a great way to have healthy and honest conversations on how to improve the employee experience, especially the onboarding process. What better way to discover how to improve the onboarding process than by asking new hires about their experience? Employees must be given the opportunity to participate in well-constructed outcome based reviews. This can be achieved by developing structured reviews that may include specific ratings, rankings, and written reviews on a mandated frequency. Employee surveys are also a great way to give new employees the opportunity to provide honest feedback about their overall experience and onboarding process. Through real-time feedback and pulse surveys, management is able to make the necessary adjustments and assessments for company initiatives. Getting employee feedback provides HR the insight they need to improve the onboarding process. New hires should not be left on their own. They should be supported from day one to ensure they feel comfortable in their work environment. Be prepared and stock their working stations with easy-to-digest guideline materials and resources so that they know where to go when they have questions. This includes contact sheets, company guidelines, access information, portal details, time-saving tools, and other onboarding material. New hires should be provided with public administration forms regarding their benefits, taxes, and direct deposits as early as day one. The more useful information, the better. And don’t limit yourself to sharing just health benefits and 401k details, add some fun collateral that represents your company culture and engages employees to want to learn more. Companies need to invest wisely when it comes to their employees and it starts with putting attention on the onboarding process. The onboarding process is critical when it comes to setting employee up for success. When employees are set up for success, they become more engaged, satisfied, and productive. Don’t fall short with your onboarding initiatives and make sure you get your new hires up to speed quick. To learn more about how you can enhance the employee experience through a culture of recognition, download this eBook. Addison Jenning is an HR manager and a passionate writer who recruits, motivates and contributes to the development of employees. She oversees the effective and successful execution of the company’s internal strategy. Addison runs Job Descriptions Wiki and she can also be found on Twitter. A quick search on Amazon.com indicates that there are more than 187,000 books with “leadership” or related words in the title. That’s a lot of content written on a single topic. However, the word “leader” has been applied to so many different areas of activity that it has become meaningless. Apart from political and military leaders, we have business leaders, market leaders, industry leaders, thought leaders, and so on. The concept has become so overused that we’ve lost a true understanding of exactly what leadership is. As a result, today’s employees don’t trust their leaders like they used to. And because of this, many areas of the business might suffer, like employee engagement and employee retention. That said, earning the title of “manager” is one of the greatest professional milestones a contributor can achieve. It means you’ve been deemed capable enough in your current job to be directing others to do it. Even though this is a leadership role, actually being seen as a leader is no easy task. It takes a great deal of devotion, stamina, and determination. A manager is someone who keeps operations running smoothly and ensures tasks are completed to meet the defined criteria. A leader, on the other hand, pushes the envelope and drives innovation. Plain and simple, business is about people, both internally and externally. A good leader is well-aware of this and uses these components to pick up on the sensitivities of those around them. They can see the big picture and acknowledge opinions in the correct context of how they fit into it. Even more, they can anticipate reactions and proceed appropriately on instinct. In terms of emotional intelligence, perhaps the most valuable trait of effective leaders is their ability to listen critically and observe neutrally. In addition to understanding what others are saying, they also take mental notes of the emotions behind the words. In many cases, these are much more important than the words themselves. Leaders are visionaries. They know how to work with what they are given and inspire others to collectively achieve long-term goals. Speaking of vision . . .
Managers are committed to an organization and its goals. Their loyalty is to the company, and they have the reliability and inflexibility typical of the “good soldier” in that commitment. They’ll ask staff to push ahead, chasing the company’s aims. But their primary duty is to the organization. When the Hackman deviant is just another team member, not a leader, they can be shouted down or frozen out, especially by over-organizing managers. But when they’re the one in charge, the whole team is moving toward innovation. If you want to be a great leader, expect – and cause – the ground to shift under your feet in ways no manager would ever want. Change your vision of commitment before you commit to your vision. Most great leaders have a common trait: their subordinates trust them and demonstrate unflinching loyalty to their cause. To achieve this, you must prove that you are willing to put yourself in the trenches and not delegate any task that you wouldn’t do yourself. In other words, you must practice what you preach and not be afraid to jump into the thick of things. Working side-by-side with your subordinates will give you a better idea of exactly how things run on the ground level as well as working knowledge of the tools and methodologies your team uses to complete their tasks and streamline job management. At the end of the day, demanding respect won’t give you the results you want. To actually earn it from those around you, one of the best things you can do is exhibit an all-for-one and one-for-all attitude. When looking at the concept of people management, there are two major theories to consider. The first one is Theory X. Managers who fall under the purview of Theory X are more pessimistic and generally assume subordinates do not like their job, avoid responsibility, and must be constantly controlled. These managers are typically known for stifling ideas and not focusing on the unique value each person offers. When this is the case, employees can easily lose motivation, resulting in a high turnover rate. In fact, a study by Gallup found that the odds of an employee being engaged are only 9% under such circumstances. On the contrary, Theory Y is the one most often adopted by respected leaders. These managers live under the assumption that their subordinates are self-motivated and can work on their own initiative. When the work environment of an organization assumes and provides for such a culture, employees feel fulfilled both personally and professionally, and are motivated to do their best work. Ultimately, it’s much harder for an organization to develop when managers tend to hold people back. A good leader encourages others to speak up and be meaningfully involved in completing the mission, rather than just following orders. Essentially, leaders coach and mentor, managers give commands. The key to becoming a “Theory Y Leader” is by promoting transparency in the workplace. Make it a point to encourage open communication. Ask for honest feedback and value everyone’s opinions. This is how company cultures evolve and employees feel more engaged. As previously stated, managers keep operations running per usual. Leaders are known to break the mold and take risks. Bill Gates dropped out of college to start Microsoft. Alexander the Great marched a tired but undefeated army on and on. The best leaders are not remembered for playing it safe when opportunity arose. To establish yourself as a leader, you must be willing to step out of your comfort zone, without being intimidated by the idea of failure. While you should always take appropriate precautions and “manage” risk, remember that leaders embrace change, even if there is nothing wrong with the current status quo. Great breakthroughs don’t happen without a significant risk factor. Leadership is about finding new and innovative ways to improve the norm. When you take risks, you are not judged by the extent of your success or failure. You are defined by the thought process underlying your approach, how you reacted throughout the execution, and what you did with the outcome. It’s important to note that leadership and management are not mutually exclusive roles. Leaders are managers by nature, and vice versa, in many instances. There will always be a need for someone to keep operations going steady. But for a business to see significant growth and development, managers must strive to push boundaries and claim new territory. The impact of a true leader is profound and influences the way people work and live. Ultimately, true leaders are those who make the world a better place. Check out The Ultimate Guide to Employee Recognition to see how leaders can effectively engage, align, and set their employees up for success. Are you haunted by worries that your best people might quit right before a key deadline? Does lack of team alignment keep you awake at night? Don’t let the tentacles of leadership doubt creep into your brain during hours when you should be rejuvenating. Read through these thirteen hair-raising employee engagement and recognition statistics below and banish any lurking shadows from your company culture. In a scary throwback to the mid-twentieth century, 87 percent of employee recognition programs center on how long the person has been at the company. While it’s true that minimizing turnover is helpful, nobody comes to work every day because of recognition they’ll be awarded in some future year. We know, your life as a manager gets hectic, and you may assume employees can read your mind when you don’t express the appreciation you feel. Pro Tip: They can’t. A Gallup survey finds that only 1 in 3 workers strongly agree that they have been praised or recognized within the past week for doing good work. According to Gallup’s 2017 State of the American Workforce report, 51 percent of employees state that they are not engaged in their jobs, which means they’re likely keeping an eye open for a new job. That’s a scary thought, isn’t it? And don’t even think about the distracted workers doing jobs that have a direct bearing on other people’s health and safety. Gallup provides some truly alarming figures related to the failure of leadership in today’s companies: Only 15 percent of employees “strongly agree” that their management gives them confidence about the future of the company, and only 13 percent state that the company’s leaders communicate effectively throughout the organization. The number of “actively disengaged” workers, at 24 percent, is nearly double the 13 percent of workers who say they are actively engaged. This can be expensive to your business, as Gallup points out that each instance of employee turnover costs your company an average of 1.5 times the employees’ salary. Research published in Human Resources Today finds that “the number one reason why people leave jobs is limited recognition and praise.” This is a simple statistic, easy to remember, that will help you keep your talented workers on board for the longer term. You may think constructive criticism will elicit star performances, but neuroscientists disagree. In fact, criticism activates higher levels of the hormone cortisol, which researchers say “shuts down the thinking center of our brain.” Praise, on the other hand, stimulates the basal ganglia to release pleasure hormones dopamine and oxytocin, which improve performance and attention levels. Do employees who aren’t praised work harder, in hopes of eventually being appreciated? Harvard Business Review says “No.” Their research points out that 40 percent of American workers say they would put more effort into their jobs if their employer recognized them more often. The Harvard Business Review study cited above also found that the average employee in their survey reported that it had been 50 days since they last felt recognized for anything they did at work. What number would your average staff person mention, if a surveyor were to ask this question? A recent Deloitte survey found that 2 out of every 3 millennials expect to leave their current job by 2020. One major reason for this restlessness is that this generation feels their skills are not recognized. Only 28 percent of respondents stated that their organization is currently making full use of their skills. To keep your younger workers engaged, you need to recognize their efforts by offering development opportunities. Management accounts for 70 percent of the variance in engagement scores. That’s both good and bad news. It means you have a huge influence when it comes to upping your employee engagement scores, but it also means that no other techniques for increasing engagement will be successful if you ignore your role in the solution. You’ve just read a dozen statistics indicating just how big the room for improvement is. Here’s one last warning to take with you: 89 percent of senior managers feel that their company is actually very good at recognizing their workers. This means they probably won’t change. Don’t be part of that overconfident group. The figures above come from a range of sources, but they all deliver one single message: Rewarding and recognizing your employees is a no-brainer. You work hard on all kinds of complex tasks in order to bring success and sustainability to your company. Don’t overlook the most obvious — and simple — building block of workforce loyalty: prompt, varied employee appreciation. For more insight on the importance of recognition in the workplace, check out Achievers’ eBook, Recognition Culture: The MVP of Employee Experience. What Does a Self-Aware Leader Look Like at Your Organization? Although most organizations spend much of their training budget on technical skills, a large percentage of leaders do not have the necessary skills and emotional competencies to manage the demands of the new economy. In Dan Goleman’s book, Working with Emotional Intelligence, his research shows that emotional intelligence (EI) is twice the indicator of leadership success as IQ and technical skills combined. He further explains that once people leave school and enter the workforce, IQ and technical skills are often equal among those climbing the professional ladder. The differentiator is emotional intelligence (hear Goleman discuss his research in this video on YouTube). Mr. Goleman has written several books and articles about how stellar career performance requires a leader to have a combination of business strategy knowledge and interpersonal skills. Many leaders don’t have the qualifications to mentor, lead, adapt, inspire, and manage others on their team. Drawing from decades of analysis of great companies, Mr. Goleman has identified that powerful leaders excel by connecting with others using emotional intelligence (EI) competencies like mindfulness, self-awareness and empathy. These skill sets exist outside the domain of technical skills or IQ. The idea of emotional intelligence is rooted in psychology and neuroscience. It suggests that when the emotional part of our brain, the amygdala, feels threatened it triggers a fight-or-flight response that can cause people to act irrationally. Acting in an emotionally intelligent way, one that is self-aware and aware of the emotions and motives of others, can help rewire our physiological responses in times of stress and crisis. Providing tools to leaders on how to self-manage and successfully communicate with others is highly effective in times of tension and complexity. We need more leaders who can deliver a difficult message in an authentic way, creating a trusting environment without hidden agendas. What can you do to start to build on your own EI skills? It starts with self-awareness. How do you respond in high-pressure moments? Are you able to understand and recognize your strengths and areas of challenge? Is there a voice in your head that is saying you are not good enough? Participate in a 360-Assessment, StrengthFinders, Disk, Myers-Briggs or Color Code. There are several assessments, and each one offers a great opportunity to learn more about yourself. Know your strengths and areas of challenge and get to know your peers and team members. Understand what ignites you and what triggers you. Do you know how your emotions impact behaviors, and can you recognize when you have impacted someone else negatively? Ask your circle of influence how you are doing and what can you do to improve. Sometimes the best advice comes from others on your team. Find a mentor – someone who can offer constructive feedback without you becoming defensive. Write down why you made a buying decision or why you hired or fired someone. Did it turn out as you expected? Understand your own emotional needs and what causes you to be triggered. Understand how you respond during pressure moments and move away from bad habits that sabotage your best performance. Identify things that have happened in your past that may not be serving your present or future. Don’t let a failure define you. Optimist view failure as a short-term setback. Are you willing to do something different and have you changed your game? Be willing to take a risk or be vulnerable to grow as a leader. Look at opportunities to balance intuition with reason and logic when taking risks. Effective self-awareness cannot be thought of as a soft science or new age meditation. It is vital to your leadership growth. As a business coach, I find many leaders are not aware enough to admit they have a problem or opportunity for growth. Often, awareness does not come to them until they experience a significant setback. Don’t wait – work on your self-awareness right now and see the impact on your Emotional Intelligence, and then see how Emotional Intelligence will change the way you work and live. If you would like to learn more about EI, check out the Southwest Institute for Emotional Intelligence. Bobi Seredich is the co-founder of the Southwest Institute for Emotional Intelligence in Phoenix, Arizona. She can be reached at bobi@swiei.com. https://www.achievers.com/blog/wp-content/uploads/2020/08/banner-6.jpg 321 845 Bobi Seredich /blog/wp-content/uploads/2015/06/engage_logo-300x1021-300x102.png Bobi Seredich2017-09-28 08:00:542018-02-08 13:48:07What Does a Self-Aware Leader Look Like at Your Organization? It seems that we can’t turn around today without having a conversation that touches on employee engagement. Yet despite all the attention, it hasn’t really moved the needle. In the time that Gallup has been measuring engagement, it hasn’t changed–engagement levels are hovering right around 30 percent. At the same time, Google data shows that there’s been a steady climb in searches and interest in the topic for the last five years. But to what end? Many companies are trying to improve this measure with little or no success. I’m going to offer two answers to this question that not only illuminate the problem, but give you some options to consider as you try to combat the problematic issue of disengaged employees. The truth is that employees are probably tired of your “programs.” Programs begin and end. A great employment relationship does more to drive engagement than a one-size-fits-all program that’s going to last a few weeks and fade into memory. Plus, as long as the company is meeting the basic elements of an employee’s needs financially, other factors come into play for influencing the level of engagement, according to motivational theory. A large chunk of money isn’t even going to work, even though many companies can’t afford to offer that to each of their staff. More money has been shown to reduce dissatisfaction, but it doesn’t drive happiness or increased satisfaction for the employee. The challenge is to see engagement not as a one-off activity, but as a holistic view of the employee experience. Being able to tie each of those disparate activities together into a cohesive experience that employees are proud of is a key element to ultimately driving engagement numbers. That means everything from the first moment the person applies for a job all the way through to managing work schedules, getting performance reviews, and beyond. Every opportunity for interaction with the organization is either a plus or a minus in the engagement column, and while we can’t expect to win every battle every time, the goal is to keep that number going in a positive direction over time (and reaping the rewards of that increased engagement, which we’ll talk about below). Innovation. Companies everywhere are trying to create more innovative atmospheres for employees. But what if the answer isn’t open office space but a higher engagement score? Innovation is a key outcome of engagement. Research by Gallup found that 61 percent of engaged employees feed off the creativity of their colleagues, compared to a mere 9 percent of disengaged employees. In addition, it found that 59 percent of engaged employees believe their job brings out their most creative ideas, compared to only 3 percent of disengaged employees. Retention. The only thing better than engaging our employees is keeping them around to deliver excellent results over time. Towers Watson research points out that retention is tied in with many of the factors that play into employee engagement, such as career advancement opportunities, confidence in senior leadership, and a manageable amount of work-related stress. Manage those factors well, and employees will stick around and produce results. Revenue. In a discussion of concrete impacts, we would be remiss if we didn’t touch on the one that matters most to many organizations: the bottom line. There are several pieces of research that demonstrate the link between engagement and financial results. According to Towers Perrin research, companies with engaged workers have 6 percent higher net profit margins, and Kenexa research points out that engaged companies have five times higher shareholder returns over five years. 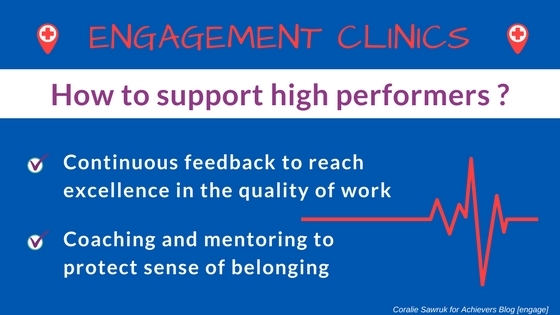 Each of these points helps to paint a more nuanced picture of employee engagement, establishing it not as a standalone program or an end result, but as a holistic journey towards greater business results. And that, ultimately, is how we can get the CEO, the leadership team, and the rest of the company on board with the idea of promoting and supporting engagement as a long-term business strategy. Want to learn more about this topic and dig deeper into the concept? I’ll be leading a session titled Stop Measuring Engagement For Its Own Sake at the Achievers Customer Experience (ACE) 2017 event in New Orleans and I’d love to have you join me for the discussion. Ben Eubanks is a human capital management industry analyst who helps companies and vendors with strategy, content, and more. 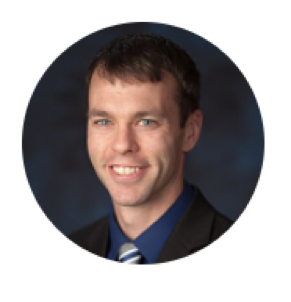 Ben has over seven years of tactical and strategic experience spanning all areas of HR and he is a nationally-recognized author and speaker on trends and best practices in human capital management. Ben is the principal analyst at Lighthouse Research & Advisory where he oversees the development of research, assets, and insights to support HR, learning, and talent vendors across the globe. Ben also co-founded the HRevolution conference for HR and recruiting leaders and is one of four members that holds this annual event, attracting hundreds of attendees from around the globe since its inception. All weekend that phrase was stuck in my brain like an annoying popcorn hull wedged between my teeth. I pondered what those words meant to each of them and what ugly truths might lurk beneath an innocuous word like “fine.” I think that phrase spoke loudly to me because I’d heard it so many times before. The low expectations expressed in the phrase “Our performance management is fine” are indicative of how much we’ve lost sight of our people. We seem perfectly happy to settle for “fine” on their behalf. 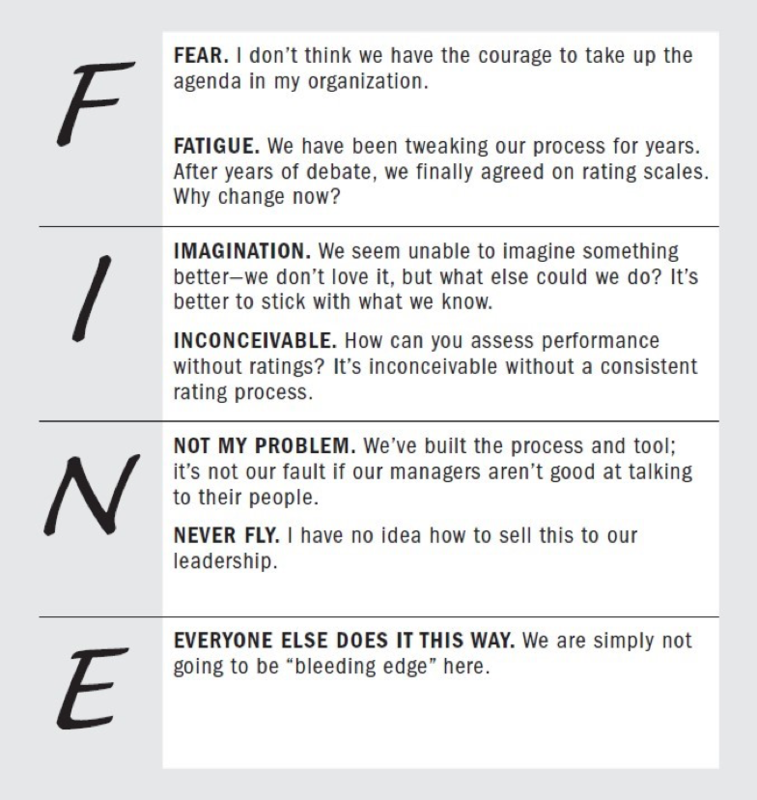 But if our intentions for investing in performance management are to connect our teams to our strategies and goals, to recognize outstanding contributions, and to enhance the development of each individual’s capabilities, how can we possibly continue to tolerate “fine”? If you’re reading this post, chances are you’re someone who is already at least partially on board with the idea of rebooting your performance management. But no matter how comfortable you are with the idea of throwing everything out to start over (or not – after all, I’m advocating a custom approach that’s tailored to the needs of your business, and yours might not need a thorough overhaul), one of the biggest stumbling blocks you’re likely to encounter is doubt, skepticism, and downright antagonism from the old schoolers in your organization. When I have a debate with someone who is defending the traditional performance management approach or with someone who is fearful of making changes to such a deeply rooted process (and trust me, I have many such debates), I always hear the same counterarguments. So much so, in fact, that it’s worthwhile to prepare you to answer those same objections in your own organization. Do any of the phrases below sound familiar? It is always wise to pay special attention to “the boss.” Engage, educate, and bring him or her with you. Of course, you can’t expect this to happen overnight, especially if the boss in question leans more toward the PM traditionalist mind-set. Meet leaders where they are, build a plan, pace your progress, and maintain your resolve. Find out what they really care about, then connect your case to that theme. Be diplomatic and creative, and make sure they understand the real costs (both soft and hard costs) to your business of continuing with the old way — in terms they understand. Other than getting leaders on board, this is the second most common concern I hear from people, and it’s a legitimate one. Since I’m advocating implementing a design that relies heavily on good, or preferably great, managers, this problem often stops teams in their tracks. It’s not a simple issue, either. It’s cluttered with questions of structure, role definition, and manager expectations. Many organizations suffer from being over-managed and under-led. This happens because we often promote managers for technical or functional expertise and not for their people or managerial skills, and because most organizations have historically underinvested in building great leaders. If this resonates with you, I’d encourage you to use it as motivation to address the bigger problem (i.e., the fact that you don’t trust your managers). Start by peeling your own onion to get at the root of your manager concern. Do you have too many managers or too many levels? Are they not the right people? Are their goals out of alignment with what’s valued by your organization as a whole? I’m not saying that these issues can be fixed quickly or easily; in fact, this may create a completely new agenda item for you. But the fact that you don’t trust the capability of your managers has much more far-reaching consequences than its impact on your performance management. It’s something that you’re going to need to address, no matter what. We know we need a paper trail to document behavior and performance problems, and we think our annual review cycle does that for us. Too often, though, it doesn’t. We’re human: we tend to rate people too leniently, and to downplay or completely gloss over potentially awkward issues. This is one reason why the reviews of underperformers and good performers often read very much the same. The problem then is that if a legal issue does arise, or we simply want to take action in response to an employee’s behavior or performance, we’re caught in a bind between what we really know about that employee’s history and a series of reviews that don’t appear all that bad. This can lead to a messy situation. It’s better to avoid this potential pitfall by documenting issues as they arise. Then the issues will be fresh and more accurately recorded—giving you better legal footing and a more actionable position overall. While the majority of organizations still use a traditional system, the tide is definitely turning. Today we’re seeing respected and forward-thinking organizations trying to drive organizational performance, develop people, and reward equitably in new and innovative ways. These pioneers have received significant positive exposure for their innovative programs. And that attention certainly doesn’t hurt their employer brand (a measure of how positively prospective employees view you compared with your competitors). You have a decision to make here: Are you ready to be out front, or would you prefer to wait until your competition has passed you by before you take action? Maybe you have to wait because you feel you have bigger issues to tackle. Or maybe you’re simply going to procrastinate until you’re finally dragged kicking and screaming into the new world of performance management at some point in the future. But like it or not, the world is changing, and our old accepted practices will eventually crumble under the weight of the research and the evolving expectations of our employees. Lead or follow—the choice is yours. If you want to learn more about performance management, join me at Achievers Customer Experience (ACE) 2017 September 12-13 where I will be speaking on How Performance Management Is Killing Performance – And What to Do About It. Check out details of my speaking session and the event here. M. Tamra Chandler is a bona fide people maven. She’s spent the majority of her career thinking about people, researching how they’re motivated, and developing new and effective ways for organizations to achieve the ultimate win-win: inspired people driving inspiring performance. She’s also the CEO and co-founder of PeopleFirm, one of Washington State’s fastest-growing businesses and most successful women-owned firms. An award-winning leader in her field (she’s been recognized by Consulting Magazine twice as one of the top consultants in the U.S.), she is the author of How Performance Management is Killing Performance — and What to Do About It. Before you start defining the elements of a healthy performance review process, it’s worth investigating how or where your process went wrong. Historically, performance reviews were created with the best of intentions and remained unchanged for centuries. The idea that people are motivated by knowing where they stand within an organization gave birth to the “rank and yank” method of ranking employees into top, average, and poor performing tiers (and eliminating those at the bottom). This was popularized by Jack Welch, former CEO and Chairman of General Electric (1980-2001). As with many common business practices, the millennial generation is challenging the way performance reviews work. Not only have forced ranking and merit-based raises been found ineffective, leaders and human resources professionals have reported performance reviews to be a significant waste of time. While performance management is sometimes a necessary evil, thankfully, the delivery system and the value it provides is trending in a healthier direction. Let’s have a look at five elements of a healthy performance review process. The traditional performance review that takes place once or twice a year tends to be an anxiety-inducing event in which employees are sometimes blindsided by their supervisor’s perception of their performance. To be effective, performance feedback should be delivered on a regularly scheduled basis so it becomes less stressful and includes more than an overview of how they have performed over the last twelve months. Employees will have a better chance to grow, improve, and possibly change their approach to work if they’re receiving timely, specific feedback rather than waiting several months to a year after the fact to hear about their performance. A healthy performance review process includes more than just feedback, it’s a great opportunity to establish goals and expectations. This is another reason the review process should be done more regularly. As soon as current goals are met or exceeded, you can put new ones in place, rather than waiting until a formal review to adjust strategy. This will help keep your team members from growing bored or frustrated and keep them focused on imperative business objectives. Meeting to discuss an employee’s performance, as well as their goals, helps you as a leader understand the direction they’re heading and how you can guide them, as well as how you can align their strengths and interests toward the shared goals of your team. If you have a learning management system in place, you can also pair some of these performance goals with specific learning or training objectives and track progress in real time. “Talking at,” your employees can make them feel intimidated, or worse, annoyed. The lack of two-way communication is one of the many reasons the traditional performance review is ineffective — more than anything, the employee just wants it to end as they might be feeling belittled, unimportant, or unheard. Instead, use the designated review time to have a two-way conversation. Spend time discussing how your employee feels about their own performance and how they feel about your performance as a leader. Ask for their thoughts on the company’s current mission and goals. Encourage them to be decisive, and solicit their ideas. Where possible, put what they tell you into action, so they know that your interest in their opinion isn’t perfunctory. This method of communication is more aligned with the modern workforce; today’s employees, especially the millennial generation, prefer coaches to managers. You already know that going into a performance review with only negative feedback can discourage an employee from making the corrective behavior necessary to get on track. A poor performer still needs to understand how their skills are valuable to the organization, the areas they are making strides in, and where you see potential for improvement. Similarly, providing only positive feedback (even to an outstanding performer) isn’t helpful either. A healthy review should balance both positive and negative feedback. Growth only comes from pushing people past what they thought they were capable of, and an ambitious employee will look for a manager willing to do just that. Your job as a leader is to do the pushing; by acknowledging areas of improvement, and establishing new goals. A system of goals and evaluation criteria is a step in the right direction if you’re hoping to boost performance. But your employees will never feel intrinsically motivated to improve unless there is some benefit or reward tied to success. If they know the only reward for above-average work is the approval of their manager, you won’t see much growth. Make sure your performance reviews are connected to a tangible reward or incentive for each employee. How you reward the employee should be individualized, and is dependent on available budget, but it could be anything from a restaurant gift card to a quarterly bonus, or even a permanent raise for the highest performing employees. Don’t let your most valuable employees feel unappreciated, demonstrate their value to them with tangible assets–verbal affirmation is nice, but it doesn’t pay the electric bill. When you do away with forced rankings and outdated goals and start having meaningful conversations with your team, you can soften the cutthroat atmosphere at work and engage your employees as individuals. This in turn will create a culture of trust, allowing for constructive criticism and healthy performance reviews that include regular, balanced feedback, goal-setting, and an opportunity for a two-way conversation. Furthermore, a healthy review process tied to measurable incentives will not only result in higher performance, but happier employees as well. To learn more, check out 6 Tips to Tackle Performance Reviews for Managers and Employees. Jessica Barrett Halcom is a writer for TechnologyAdvice.com, with specializations in human resources, healthcare, and transportation. She holds a bachelor’s degree from the University of Wisconsin, Green Bay and currently lives in Nashville, TN. According to Bersin by Deloitte, “employee engagement” refers to, “An employee’s job satisfaction, loyalty and inclination to expend discretionary effort toward organizational goals.” The more engaged employees you have, the more positive results you will see – from both a bottom line and a corporate culture standpoint. It’s as simple as that. But as Gallup recently reported, a mere 13% of employees worldwide are engaged at work! And it’s not that much better here in the U.S., where only one in three employees are engaged at work. We aren’t suggesting you should abandon your entire functional structure, but when thinking about roles, titles and capabilities it’s important to keep individual employees in mind. Management expert Glen Llopis encourages supervisors to build each job around the capabilities and interests of the person who currently holds that position. He points out that people stay more focused and perform much better when they enjoy the work they’re doing, and a good manager should be able to expand their leadership lens to consider an employee’s strengths when assigning any projects. Managers aren’t the only ones who can commend a job well done. Encouraging peer-to-peer recognition within the workplace can be invaluable in increasing employee engagement. A simple “great job” from a co-worker goes a long way in encouraging employees to embrace teamwork and celebrate accomplishments. When co-workers celebrate shared wins and encourage one another to succeed, they are motivated to perform at their best and gain a sense of camaraderie around achieving one common goal. Spreading praise throughout the office is contagious and serves the dual purpose of instantly engaging employees and building a supportive work culture around shared goals and values. If you trust your employees enough to tell them about your company’s challenges – as well as its victories – you’ll find that they place a high value on your honesty. When employees feel like they’ve been brought in on the real, inside story, they are better able to understand the reasoning behind their company’s policies and actions. As an additional benefit, greater transparency and democratization often lead to innovation, as employees feel inspired and empowered to offer creative solutions to shared problems, which they will likely want to implement themselves. This approach may require a shift in perspective, especially if your company is accustomed to placing multiple filters between the C-suite and line workers. But it’s been proven that in companies with a flat organizational structure transparency can have some very tangible positive results. “Congratulate” is one of the “10 C’s” of employee engagement listed by Ivey Business Journal, and there’s a good reason for this. Their research finds that most employees feel that they receive immediate feedback (otherwise known as criticism) when they do something wrong, but that recognition for their positive contributions is usually slow in coming. The most effective leaders make sure to deliver immediate recognition and tangible rewards for a job well done. Rewards and recognition are most impactful when given frequently and tied back to specific desired behaviors or actions, as opposed to generally positive feedback provided quarterly or even yearly. Employee engagement is not something to take lightly. Industry research shows why employee engagement matters: Just a 1% increase in employee engagement leads directly to an additional .6% growth in sales (according to Aon Hewitt) and companies with highly engaged workplaces have been shown to outperform their peers by 147%. So don’t pass up these simple solutions to help address a complex issue. Learn more about milestones along the route to employee engagement from our Getting to Greatness Infographic.